• Orange-30 seconds, Green-1 min., Purple-2 min., Yellow-3 min., Red-5 min., Blue-10 min. Orange, Purple, Red and Yellow. • Softball is 5.5” dia. and weighs only 3 oz. 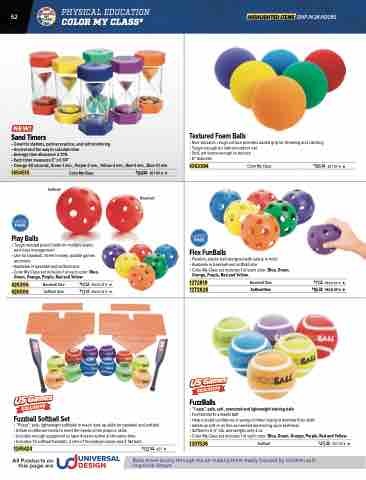 • Includes: 12 softball fuzzballs, 2 sets of throwdown bases and 2 flat bats. Balls move slowly through the air making them easily tracked by children with cognitive delays.